OSHA has awarded $10.5 million in one-year federal safety and health training grants to 77 nonprofit organizations nationwide. The grants will provide training for workers and employers on the prevention of safety and health hazards in their workplaces, and will inform workers and employers of their rights responsibilities under the OSH Act. OSHA's Susan Harwood Training Grants Program funds grants to nonprofit organizations, including community/faith-based groups, employer associations, labor unions, joint labor/management associations, colleges and universities. Target trainees include small-business employers and underserved vulnerable workers in high-hazard industries. "The Susan Harwood Training Grant Program is one of the most effective ways we have for communicating with vulnerable and hard-to-reach workers in high-hazard industries who may not know how to avoid and prevent safety and health hazards in their workplaces," said Assistant Secretary of Labor for Occupational Safety and Health Dr. David Michaels. 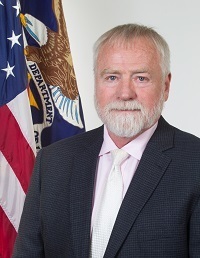 OSHA Assistant Secretary Dr. David Michaels appointed Dean McKenzie as the new director of the agency's Directorate of Construction. McKenzie has been with OSHA for seven years including serving as deputy director of DOC. McKenzie's experience in the construction field spans more than four decades. He began his career in the steel mills of Gary, Ind., as a journeyman millwright, and he worked industrial construction in Indiana, Florida, Colorado and the Caribbean. He has been a licensed general contractor, business owner, and project and operations manager. During his years with OSHA, his accomplishments include addressing fatalities in the communication tower industry, building a strong relationship with the Advisory Committee on Construction Safety and Health, and taking a lead role in the Stand Down to Prevent Falls in Construction campaign. "Dean has been a valuable member of the OSHA team," said Michaels. "I congratulate him on his new position, and I am confident he will continue with his forward thinking and innovative leadership in DOC." In response to a worker complaint and as part of the agency's Regional Emphasis Program on Safety Hazards in the Auto Parts Industry, OSHA conducted an inspection at HP Pelzer Automotive Systems Inc. in March 2016. OSHA cited the company and Sizemore Inc., a staffing agency it employs, with 24 safety violations for fall, amputation, and electrocution hazards, including 12 repeated citations for HP Pelzer. "This is the third inspection of the HP Pelzer plant where OSHA has identified numerous hazards, many repeated, related to unsafe working conditions," said William Fulcher, OSHA's area director in the Atlanta-East Office. The two companies face a total of $704,610 in penalties, including fines of $49,884 for the staffing agency. Sizemore had approximately 300 temporary employees assigned to HP Pelzer at the time of the inspection, but terminated its contract in May 2016 for reasons including safety concerns for its employees. For more information, see the news release. An elevator superintendent clearing debris from a soybean bin suffocated when his lifeline became entangled in an unguarded and rotating auger. OSHA's investigation of his employer, Cooperative Producers Inc., of Prosser, Neb., found several violations of the agency's grain handling standards including failure to: disconnect a subfloor auger and test atmospheric conditions in grain bins before allowing workers to enter; implement lockout/tagout procedures; and install machine guarding to avoid contact with moving machine parts. The company was issued willful and serious violations and proposed penalties of $411,540. This is the seventh time since 2011 the company has been cited for similar violations. It has been placed in the agency's Severe Violator Enforcement Program. For more information, read the news release. A worker for TimkenSteel Corp. was found dead in the facility's elevator control room after a nitrogen leak caused an oxygen-deficient atmosphere. The worker was performing a monthly fire extinguisher check. OSHA cited the Canton, Ohio, steel mill for six safety violations for failing to protect workers from potentially hazardous atmospheres, and failing to train workers on the hazards of using nitrogen-powered pneumatic tools. OSHA responded to a safety complaint two days prior to the fatality and found that the company exposed workers to fall hazards of up to 20 feet and failed to install guardrails on walkways. Proposed penalties total $113,131. Read the news release for more information. Complaints of sore throats, headaches and difficulty breathing from employees of Quest Diagnostics Corp.'s Ameripath laboratory resulted in an OSHA inspection of the Bridgeport, Conn., facility. Inspectors found violations of the agency's laboratory safety standard. Other violations included failing to: allow appropriate medical examinations for workers showing symptoms of exposure to hazardous chemicals; train workers on how to detect the presence of hazardous chemicals; and implement a chemical hygiene plan for lab workers. "A laboratory chemical hygiene plan is not a paper exercise." "A laboratory chemical hygiene plan is not a paper exercise," said Robert Kowalski, OSHA's area director in Bridgeport. "It's a continuous ongoing process that is key to preventing employees from being sickened by the hazardous chemicals with which they work." The company was cited for 17 safety violations and proposed penalties of $152,435. Read the news release for more information. After citing AJ New Construction and Repair Inc. of St. Johns, Fla., in 2014 and again in 2015 for repeated and serious violations of workplace safety standards, OSHA recently inspected two company sites and issued new citations. The latest citations — one willful and one repeated violation — were issued in August after the company allowed its employees to work from heights up to 10 feet without fall protection. Proposed penalties total $139,000. For details, see the news release. After conducting another construction site inspection in Florida recently, OSHA cited Rogero & Williams Roofing Contractors Inc. of St. Augustine for one willful and one serious safety violation. OSHA found employees at a residence performing re-roofing work without fall protection. The employer also failed to require a worker to wear eye protection while using a blower to move debris. Proposed penalties total $128,077. For information, see the news release. "Falls are a leading cause of death in the construction industry and can be prevented if employers ensure workers are protected with a fall protection system," said Brian Sturtecky, OSHA's area director in Jacksonville. More life-saving information about preventing falls is at OSHA's Stop Falls webpage. The Washington Department of Labor & Industries issued $51,500 in fines to Alki Construction LLC of Seattle after an inspection revealed safety violations that contributed to the death of a worker in a trench collapse. WA L&I inspectors determined that the company failed to install a protective system to prevent cave-ins, provide a ladder or other safe means to exit the trench, and establish a formal prevention program addressing trenching and excavation hazards. For more information, see the news release. California OSHA issued $101,385 in penalties to SW Forage LLC of Hesperia following a February incident where a worker was caught and killed in a forage compactor. Cal/OSHA inspectors concluded that the company failed to properly label, stop and de-energize machine movements during cleaning and servicing, exposing the worker to fatal injuries. The company also failed to train workers on hazardous energy control procedures and did not provide guardrails on all open sides of elevated work locations. OSHA has published new guidelines for approving settlements between employers and employees in whistleblower cases to ensure that they do not contain terms that could be interpreted to restrict future whistleblowing. The new guidelines respond to a March 2015 petition for rulemaking from the Government Accountability Project, which asked OSHA to clarify that it will not approve settlements that discourage whistleblowing. In particular, the updated guidelines make clear that OSHA will not approve a settlement that contains a provision that restricts the employee’s right to provide information to the government or requires the employee to notify the employer before or after communicating with the government. OSHA also will not approve an agreement that requires a whistleblower to waive his or her right to receive a monetary award from a government-administered whistleblower program or to pay the employer a portion of such an award. For more information, see the news release. OSHA and Health Canada, through the Regulatory Cooperation Council, have jointly developed a 2016-2017 Workplace Chemicals Work Plan. The purpose of the work plan is to ensure that current and future requirements for classifying and communicating the hazards of workplace chemicals will be acceptable in the United States and Canada without reducing worker safety. OSHA signed a Memorandum of Understanding with Canada's Department of Health in 2013. The goal of the MOU is to devise a system, accepted by both countries, that allows the use of one label and one safety data sheet. For more information, see the news release. OSHA aligned its Hazard Communication Standard with the GHS in March 2012 to provide a common, understandable approach to classifying chemicals and communicating hazard information on labels and safety data sheets. OSHA's Hazard Communication webpage includes links to the standard, frequently asked questions and guidance materials. OSHA has issued a Request for Information as the agency considers updating its safety standards addressing falls in shipyards. The RFI specifically seeks comments and information on safe access and egress of vessels, buildings, and other structures in shipyard-related employment (including the use of stairways and ladders); use of fall and falling object protection; and erection, use, and dismantling of scaffolding systems. OSHA will use the comments received to learn more about current practices used to protect workers from shipyard hazards, and determine if revisions to the standards are necessary. Comments and materials must be submitted by Dec. 7. Interested parties may submit comments at www.regulations.gov, or by mail, fax or hand delivery. See the news release and Federal Register notice for details. Deputy Assistant Secretary Jordan Barab met with top executives from the U.S. Poultry & Egg Association in Washington on Sept. 14 to discuss health and safety in the industry. The meeting was held as OSHA continues its regional poultry emphasis programs, which have resulted in numerous citations in recent months, such as those issued following inspections in Alabama, Florida and Texas. Workers in the poultry industry face serious hazards – including dangerous equipment, high noise levels, exposure to infectious pathogens and hazardous chemicals such as ammonia, chlorine, and antimicrobial agents. Poultry workers are also at high risk of developing musculoskeletal disorders from the repetitive motions they perform on the job. In fact, workers on poultry-processing lines are seven times more likely to develop carpal tunnel syndrome than the average U.S. worker. In addition, OSHA’s new requirement to report amputations and hospitalizations has brought more poultry industry problems to our attention. OSHA is especially concerned with medical mismanagement, which can lead to the underreporting of injuries. Barab encouraged the executives to take advantage of OSHA resources, such as our on-site consultation services, to help find and fix hazards and improve safety and health at their workplaces. In recognition of this year's Labor Rights Week, OSHA's area offices renewed several alliances with consulates and worker groups to protect the rights of vulnerable workers. Travis Clark, director of OSHA's Corpus Christi Area Office signs alliance renewals with Consul General of Mexico, Carolina Zaragoza Flores in Laredo, Texas. The Mexican Consulates in Brownsville and Laredo, Texas, met with Travis Clark, director of OSHA's Corpus Christi Area Office, to renew two-year alliances that provide Spanish-speaking workers with assistance and outreach materials in Spanish. Details are in the news release. R. Casey Perkins, director of OSHA's Austin Area Office, and José P. Garza, executive director of the Workers Defense Project, signed an alliance on Aug. 30 to promote a greater understanding of the workplace safety and health rights of immigrant Hispanic workers. The alliance will help improve safety by informing workers of their OSHA workplace rights and increasing awareness of hazards. For more information, see the news release. 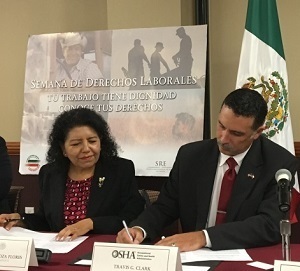 OSHA and the newly opened Consulate of Mexico in Milwaukee also formed an alliance to enhance workplace safety for workers in Wisconsin and portions of Michigan. The alliance agreement was signed Sept. 6 during a Labor Rights Week event held at the Milwaukee Consulate. Under this agreement, the partners will work together to develop educational and training resources to help workers understand their rights and the responsibilities of their employers under the OSH Act. Armacell LLC, a manufacturer of flexible foams for equipment insulation located in Dallas, Ga., reached out to its workers' compensation insurance broker for advice on how to lower its injury and illness rates. The insurance carrier recommended that Armacell contact OSHA's On-site Consultation Program. OSHA consultants helped Armacell implement many safety initiatives, such as extensive training programs, to ensure the safety and health of its workers. After following the consultants' recommendations and meeting OSHA requirements, Armacell attained certification in the agency's Safety and Health Recognition Program and this year surpassed one million hours without an OSHA lost-time injury. For more information, see the success story. 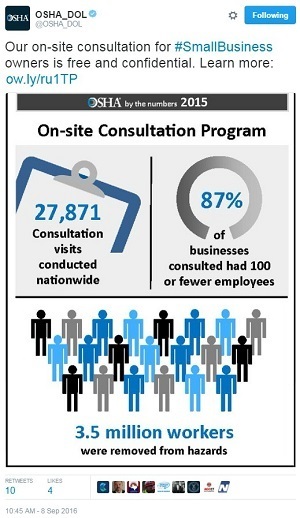 OSHA's On-site Consultation Program offers free, confidential safety and health advice to small and medium-sized businesses with priority given to high-hazard worksites. The service is voluntary, separate from enforcement, and does not result in penalties or citations. JLG Industries Inc., a global manufacturer of aerial work platforms and telescopic material handlers, received Star certifications from OSHA's Voluntary Protection Programs for safety improvements at the company's plants in Shippensburg and Bedford, Penn. Employers and employees at Star worksites demonstrate exemplary achievement in the prevention and control of occupational safety and health hazards through the development, implementation and continuous improvement of their safety and health programs. To help keep workers safe, for example, JLG Shippensburg designed a new training room where workers can safely practice operating a crane and sling assembly. At its Bedford location, workers participate in daily safety inspections, the first aid team, and the safety committee. OSHA has issued two new bulletins in its series of guidance documents developed under the agency’s Temporary Worker Initiative. This initiative focuses on compliance with safety and health requirements when temporary workers are employed under the joint employment of a staffing agency and a host employer. The bulletins address bloodborne pathogens and powered industrial truck training. Both documents emphasize that temporary workers are entitled to the same protections under the OSH Act as all other covered workers and that the host employer and staffing agency are responsible for determining the conditions of employment and complying with the law. QuickTakes is a product of OSHA's Office of Communications. If you have comments or suggestions that you think could improve the quality of QuickTakes, please submit them to OSHA.QuickTakes@dol.gov	or contact the Office of Communications at 202-693-1999. [Note: This address is for input on QuickTakes only. Other questions concerning OSHA should be submitted through the agency's Electronic Mail Form.] For more information on occupational safety and health, visit OSHA's website.